"Silver mine" redirects here. For other uses, see Silvermine (disambiguation). Silver is found in native form very rarely as nuggets, but more usually combined with sulfur, arsenic, antimony, or chlorine and in various ores such as argentite (Ag2S), chlorargyrite ("horn silver," AgCl), and galena (a lead ore often containing significant amounts of silver). As silver is often found in conjunction with these or alloyed with other metals such as gold, it usually must be further extracted through amalgamation or electrolysis. Early silver Athenian coin, 5th century BCE. British Museum. Silver has been known since ancient times. Silver is mentioned in the Book of Genesis, and slag heaps found in Asia Minor and on the islands of the Aegean Sea indicate that silver was being separated from lead as early as the 4th millennium BC. The silver mines at Laurium were very rich and helped provide a currency for the economy of Ancient Athens. It involved mining the ore in underground galleries, washing the ores and smelting it to produce the metal. Elaborate washing tables still exist at the site using rain water held in cisterns and collected during the winter months. Extraction of silver from lead ore was widespread in Roman Britain as a result of Roman mining very soon after the conquest of the first century AD. From the mid-15th century silver began to be extracted from copper ores in massive quantities using the liquation process creating a boost to the mining and metallurgy industries of Central Europe. 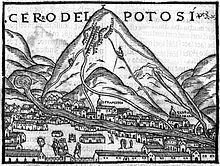 Potosi, discovered in 1545, produced massive amounts of silver from a single site in upper Peru. The first image published in Europe. Pedro Cieza de León, 1553. Silver Spanish real from the silver of Potosí, Bolivia. 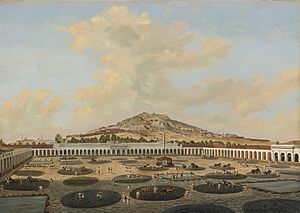 The amount of silver mined at Potosí and other locations in the Spanish Empire led to significant inflation in Europe. Vast amounts of silver were brought into the possession of the crowns of Europe after the conquest of the Americas from the now Mexican state of Zacatecas (discovered in 1546) and Potosí (Bolivia, also discovered in 1546), which triggered a period of inflation in Europe. Silver mining required large amounts of mercury to extract the metal from ore. In the Andes, the source was the Huancavelica mercury mine; Mexico was dependent on mercury from the Almadén mercury mine in Spain. Mercury had a very high and adverse environmental impact. Silver was extremely valuable in China, became a global commodity, contributing to the rise of the Spanish Empire. The rise and fall of its value affected the world market. In the first half of the 19th century Chilean mining revived due to a silver rush in the Norte Chico region, leading to an increased presence of Chileans in the Atacama desert and a shift away from an agriculture based economy. Silver mining was a driving force in the settlement of western North America, with major booms for silver and associated minerals (lead, mostly) in the galena ore silver is most commonly found in. Notable silver rushes were in Colorado; Nevada; Cobalt, Ontario; California and the Kootenay region of British Columbia; notably in the Boundary and "Silvery" Slocan. The first major silver ore deposits in the United States were discovered at the Comstock Lode in Virginia City, Nevada, in 1859. Depiction of the patio process at the Hacienda Nueva de Fresnillo, Zacatecas, Pietro Gualdi, 1846. The principal sources of silver are copper, copper-nickel, gold, lead, and lead-zinc ores obtained from Canada, Mexico, Poland, Peru, Bolivia, Australia and the United States. Mexico was the world's largest silver producer in 2014, producing 5,000 metric tons (161 million troy ounces), 18.7 percent of the 26,800 tonne (862 million troy ounce) production of the world. ^ Nicholas A. Robins, Mercury, Mining, and Empire: The Human and Ecological Cost of Colonial Silver Mining in the Andes. Bloomington: Indian University Press 2011. ^ "pg. 152 – Silver" (PDF). USGS. 2016. Retrieved 29 February 2016. ^ CPM Group (2011). The CPM Silver Yearbook 2011. New York, NY: Euromoney Books. p. 68. ISBN 978-0-9826741-4-7. ^ CPM Group (2011). The CPM Silver Yearbook 2011. New York, NY: Euromoney Books. p. 74. ISBN 978-0-9826741-4-7. ^ "43-101 Preliminary Economic Assessment Technical Report Malku Khota" (PDF). South American Silver Corp. Retrieved July 26, 2011. Bakewell, Peter J. Silver Mining and Society in Colonial Mexico: Zacatecas, 1540-1700. New York: Cambridge University Press 1971. Bakewell, Peter J. Miners of the Red Mountain: Indian Labor in Potosí, 1545-1650. Albuquerque: University of New Mexico Press 1984. Bakewell, Peter J., ed. Mining of Gold and Silver in the Americas. Brookfield, VT 1997. Brading, D.A. Miners and Merchants in Bourbon Mexico, 1763-1810. New York: Cambridge University Press 1971. Brading, D.A. and Harry E. Cross. "Colonial Silver Mining: Mexico and Peru." Hispanic American Historical Review 52 (19720): 545-79. Cole, Jeffrey A. The Potosí Mita 1573-1700. Compulsory Indian Labor in the Andes. Stanford: Stanford University Press 1985. Hoberman, Louisa. Mexico's Merchant Elite, 1590-1660: Silver, State, and Society. Durham: Duke University Press 1991. Richards, J.F., ed. Precious Metals in the later Medieval and Early Modern Worlds. Durham: Duke University Press 1983. Whitaker, Arthur P. The Huancavelica Mercury Mine. Cambridge: Harvard University Press 1941. Wikimedia Commons has media related to Silver mining. This page was last edited on 1 January 2019, at 14:33 (UTC).